The Republican Party is about to nominate a mime for President, and the Secret Service has 90 minutes to figure out who in his inner circle wants him dead. His best friend with him since the beginning. Clynell Daggett struggling with Brad's sudden fame and Clynell's equally sudden submersion in the shadows. His corporate handler. Belton Beming struggling with Brad's sudden fortune and Belton's losing control of the image Brad projects. His political team. Dorothy Barrymore struggling with Brad's sudden success and her dawning realization that she could be responsible for the most disastrous President ever. They all know that he would make an awful President. But who is willing to do something about it? More than just voting their conscience. So in order to keep this crime from the public, Secret Service agent John W. Singer has gathered the all suspects together in one room. On the eve of the Republican National Convention, he knows there's only one chance to solve this mystery, cut through the lies and broken dreams, and deal with the one person who could actually silence the Mime. 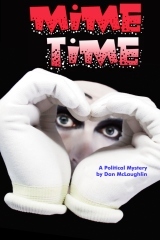 It's a time to elect, or kill, the first mime President. In the meantime here are some samples to give you an idea what the book is about. The book is basically the characters reaction to what is being said to them. The dialogues is in italics. The internal dialogues are in regular type. The person whose internal dialogue it is is given in the chapter heading. Thus is this sample you have entered the mind of Dorothy Barrymore as she hears why she was called out of bed by the Secret Service. And here is a free sample as you enter the brain of Belton Beming having dinner with Mrs. Tapelson after Mr. Tapelson has hit her during an arguement. Go here and buy it!